Hundreds of tiny, preachy phrases cover every inch of a bottle of Dr. Bronner’s. Emanuel Bronner (r.) was a self-styled philosopher-mystic who urged all to put aside their racial and national differences. Today, the firm is run by his grandsons David (l.) and Michael Bronner, who have preserved their grandfather’s soap formula and his vision for a united world, encapsulated in aphorisms like the one above. It goes on. And on. Hundreds of these tiny, preachy, semi-coherent phrases cover every inch of the bottle. 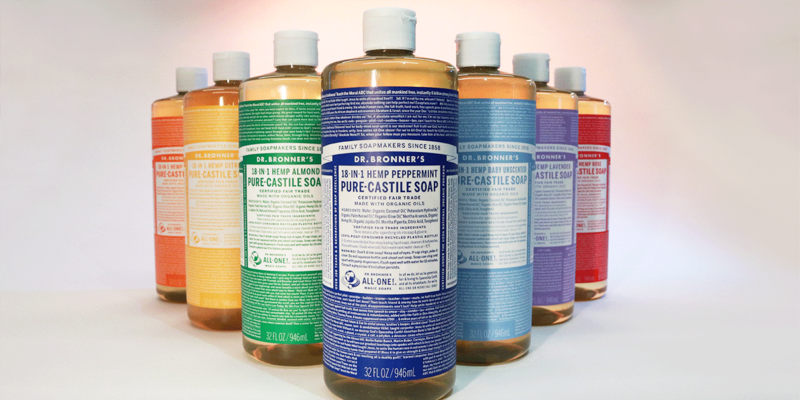 All of them are the work of late visionary Emanuel Bronner, a German-Jewish soap maker who escaped Hitler, then came to America to preach his vision of a unified mankind. Bronner’s mystical rantings landed him in a mental institution (he escaped that, too), after which the good doctor (who wasn’t really a doctor) started selling his family-recipe peppermint soap to finance his itinerant sermonizing—only to begin printing his sermons on the label once he realized people were more into his soap than his teachings. Hemp: Omega-3 fatty acids in hemp make the soap smoother and give it its amber color. Creed: Blind toward the end of his life, Bronner didn’t realize how many words of his “Moral ABCs” he’d crammed onto the label. Now it’s the brand’s signature. Suds: Made with oils instead of fats, Dr. Bronner’s produces a “velvety” lather that leaves no residue. That’s because the Moral ABCs are the ethos of the company (as Bronner summarizes: “We have to realize our transcendent unity across religious and ethnic divides, be responsible in our consumption choices and respect the earth”) and no small reason for the brand’s success. 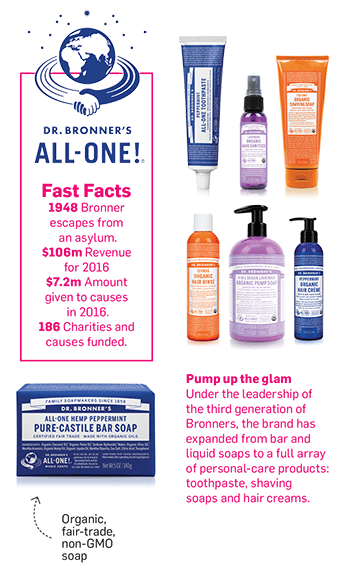 Dr. Bronner’s is a small, Southern California brand with 150 employees, yet its 2015 revenue came in at $95.7 million, a 126 percent increase from 2011. The soap’s fans (including celebrities like Lady Gaga and Marc Maron) swear by the stuff. Part of the reason is because Dr. Bronner’s is simply very good soap: Free of artificial ingredients and made with high-cost emollients like organic coconut oil from Sri Lanka, its thick and silky lather leaves a signature tingle in one’s nether regions that one customer likened to a peppermint patty in her underwear. 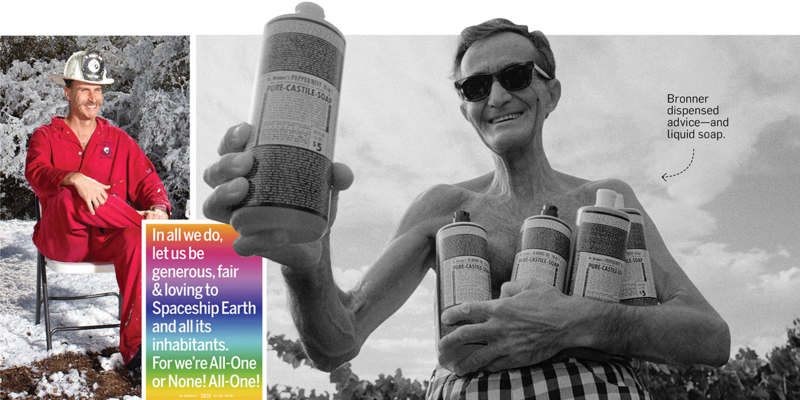 But customers who buy Dr. Bronner’s are also funding the company’s determination to make the world—or “Spaceship Earth,” in Bronner parlance—a better place. 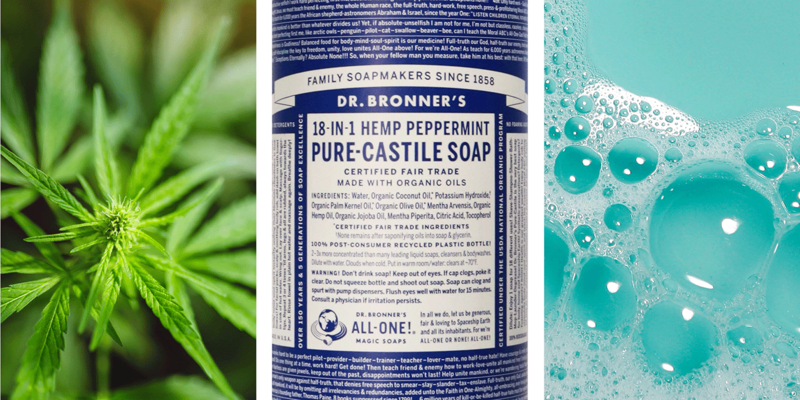 A Certified B corporation committed to fair trade and organic farming, Dr. Bronner’s supports causes including living-wage initiatives, immigration reform and cannabis legalization.